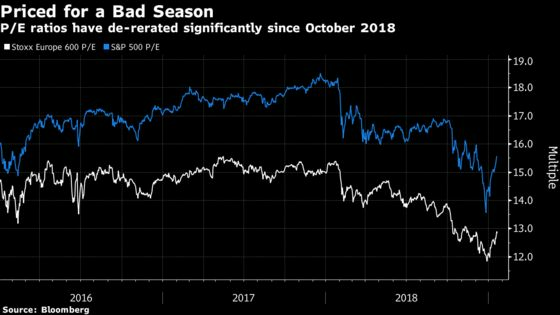 (Bloomberg) -- The coming earnings season is likely to be ugly, but that may not be taken badly by an equity market that’s already anticipating negative news, according to JPMorgan Chase & Co. Particularly weak activity indicators in Europe suggest the coming season is likely to be challenging and below consensus estimates, according to strategist Mislav Matejka, who has cut his expectations for the region’s earnings-per-share growth by 3 percent for the year. Yet Matejka still forecasts European equities will return 10 percent by the end of 2019, saying the market doesn’t necessarily need to see some earnings growth to find a floor. 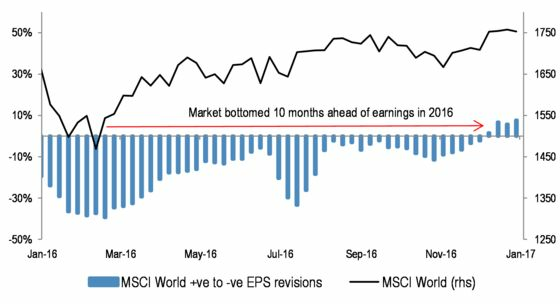 He sees similarities to 2016, when equities bottomed in February, 10 months before EPS revisions turned positive. “EPS growth remained outright negative for the two quarterly results seasons, 1Q16 and 2Q16, after the bottom in the equity market,” he wrote. The strategist believes investors are prepared for a disappointing earnings season, given a sharp fall in price-to-earnings multiples for European and U.S. equities since October -- 8 and 9 percent, respectively. He notes that while the consensus for fourth-quarter earnings is still too high, it has already come down by 5 percent to 7 percent in key regions. A pause in Federal Reserve policy, a peaking dollar, as well as a stabilization in U.S. and China’s activity momentum, will allow equities to continue their bottoming-out process, according to Matejka, who favors U.S. equities as they are likely to deliver better earnings than their European counterparts in the fourth quarter and beyond.